Get a free Peace of Mind Inspection ($120 value) with your $50 seasonal tire changeover. * $50 tire changeover applies when tires are on the wheels, includes tire re-balance. DJ’s Garage is a general automotive service and repair shop specializing in both light and medium duty. 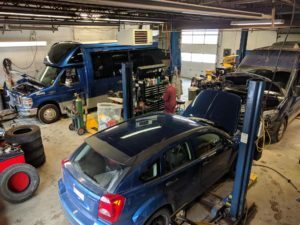 Cars, trucks, and buses - we do it all.